No idea what's happened to my sidebar ... will try to figure that out. Sometimes it's there, sometimes not. Hi MYM, thanks for hosting this meme in 2012. Mark Australia. looks to be enjoying that bright yellow star very much! Those are cute. Happy MYM! And he has yellow toys! Someday I will have a parakeet again. They are such fun and cheeky little birds. Looks like he's having fun! 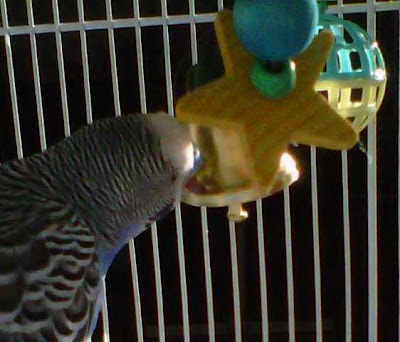 The bird loves the new toy! Last parakeet I had said about 30 different things! Is your pretty little bird a talker? Wonderful photo; I love birds. Merry Christmas! I used to have 2 little birds and I loved them. But now I have no pets and am just as happy. We have had a parakeet for years, loved it! Cute pic! Thanks for hosting! Good luck with the sidebar! I am so computer illiterate. I get SO frustrated when things like that happen! It's got quite a few beneficial capabilities. It truly is made from [URL=http://www.northfaceapexbionicjacket.org/#1088]north face apex sale[/URL] materials, yet thinks gentle and relaxed.Its northern border Experience is surely an American Centered enterprise which was established within s. The business started off the business with a retail keep for Mountain Climbers and bought its [URL=http://www.northfaceapexbionicjacket.org/#1088]north face apex sale[/URL] from there as North address. Later on, they began making products for snowboarding as well as skiing.